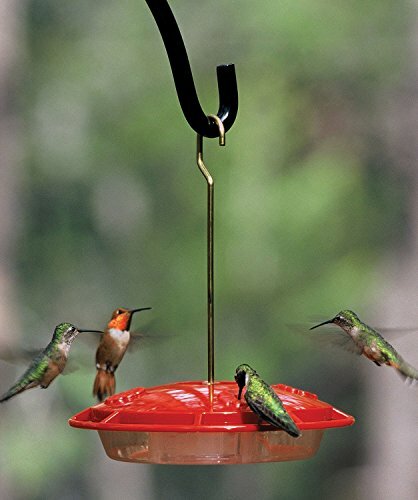 Do you find yourself feeding the hummingbirds and every other winged creature in the region? It can be frustrating. But, there are ways to discourage bees from choosing your hummingbird feeder. If you are having problems with bees visiting your hummingbird feeders, you are not alone. This is a common problem expressed by bird-loving homeowners each year. Perhaps you enjoy both bees and hummers. You don’t have to choose one or the other. And, you don’t have to resort to harsh chemicals – which can harm you and the birds too! Hummingbirds love sweet nectar. Bees love sweet nectar. See a pattern? The honey bees are not intentionally trying to destroy your enjoyment of hummers. They are just trying to get by and live like everything else. You may notice that bees are attracted to your feeders more at certain times of the year. We will discuss that further in a bit – why it happens and what to do. Can We Really Control Any Wild Being? No. We are dealing with wild creatures so let’s remember that we can’t control either the birds or the bees. But, we can work within their natural tendencies to make the situation more enjoyable for our hummingbird friends. The methods in this article may not keep every single bee far away from your feeders. But, they will be a big help. A couple of bees around the feeder is no big deal. For the birds, sharing nectar with bees and wasps is normal. Unfortunately, the bees often leave and return with their sisters! Honey bees taking over hummingbird feeders is a special problem for those of us who are beekeepers. This is especially true if you live in a neighborhood with hummer lover neighbors close by. We can certainly understand the frustration of the hummer loving homeowner. But, please don’t spray our bees with deadly chemicals. Trying to kill bees around the feeder is not a good idea. More and more will come to take their place. This action hurts the bee colony and does not solve the problem of keeping bees away from the hummingbird feeder. This may sound too simplistic but it is the truth. The best way to keep bees from taking over your hummingbird feeder is to stop it before it starts. It is much easier to prevent the problem-than fix it. Understanding the nature of both birds and bees can help in our feeding dilemma. And yes, you may need to relocate your bird feeders – at least temporarily. We can all agree that a beautiful iridescent hummingbird flitting from flower to flower is a delight. Everyone seems to love hummingbirds. Hummers feature a charisma that no other bird possesses. Their flight skills include the ability to hover and even fly backwards. They move so fast you may miss them if you blink. Its a good thing they can move quickly. Some species of hummingbirds migrate 3,000 miles in one direction. Humming birds seek out sweet nectar. 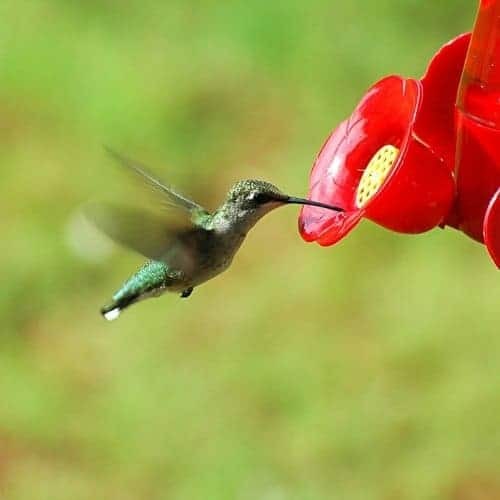 Natural nectar from flowers and artificial nectar provided by us is attractive to hummingbirds. If you hang out a feeder, they will find it. Unfortunately, they are not the only ones searching for nectar. The decline of honey bees in recent years has received a lot of media attention. Today, people have a better understanding of the importance of honey bees and other pollinators. Honey bees are responsible for millions of dollars of value due to their pollination efforts. They also help with pollination of vegetable gardens and fruit trees in our local neighborhoods. However, bees need nectar to survive. Why Are Bees Taking Over My Hummingbird Feeder? Honeybees & Hummingbirds have something in common. Both love sugary nectar as a food source. And, the honey bees (who do not migrate) have to store food for winter. It is not unusual to see both bees and birds harvesting nectar from the same blooming plants. In nature, the practice of sharing nectar sources works out well with plenty of flowers for all. The difficulties start when the time of heavy bloom fades. Nectar sources are often limited during the hot dry summer. As sure as, July will bring hot humid weather in the south, it will also bring complaints from homeowners who are trying to feed hummingbirds. A homeowner goes out to enjoy the tiny birds and discovers a small swarm of bees. Or, perhaps hundreds of bees and wasps trying to drink from the feeder. It can get so bad that the birds stay away. In addition to being a nuisance, hundreds of bees can drain a full hummingbird feeder quickly. Trying to find a way to keep honey bees off hummingbird feeders is challenging. These foraging worker bees are not aggressive. They will not attack you – but will defend themselves if threatened. It is much better to prevent bees and wasps from using your hummingbird feeder than it is to stop it. Honey bees are hard workers and these hungry bees will search out any sweet source available! Unfortunately for you, the best available nectar source may be your hummingbird feeder. The considerate homeowner looks for a solution that will do no harm to the honey bees. And still allow the enjoyment of the birds. What to do when Honeybees & Hummingbirds clash at your feeder ? Here are the tips that most homeowners don’t know. Let’s look at each one and discuss why they may work for you. 1. 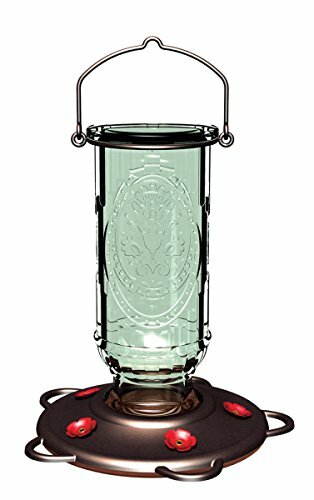 * Choose a hummingbird feeder that has insect resistant feeding holes. Feeders of this type will deter honeybees, wasps, etc. *You may be able to purchase bee guards for your existing feeders. 2. * Look for feeders that are all red (without the yellow inserts). Red attracts hummingbirds – yellow attracts insects. If you already have a feeder with yellow feed ports, paint them red using non-toxic paint. 3. * Move the hummingbird feeder to a shady location. Hummers will seek them out but insects prefer food sources that are in a sunny location. 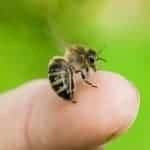 This is especially useful for times of drought – when the bees may be suffering from lack of flower nectar. Use a mixture of sugar water (2 cups white cane sugar dissolved in 1 cup water) in a shallow dish or pan filled with marbles, gravel or stones (so the bees wont drown). The bees should move to the new food source as they prefer a sweeter solution. Every day move the honeybee feeder a little farther away – in time this should get the bees focused on something different than your feeder. Choose landscape plants that pollinators like. Keep them watered during the hot summer, if possible to encourage, nectar production. On my bee farm, I have only had to keep honey bees away from hummingbird feeders during one summer. During that year, upstate South Carolina was suffering a severe drought. I felt sorry for my bees and the birds. After a few weeks, we were lucky to receive some rain showers. This additional moisture resulted in new blooms with nectar for all pollinators. And the bees left my feeders alone. If space allows the homeowner can plant flowers that will benefit both hummers and bees-even in times of drought. A bee friendly garden is also a friendly garden for other pollinators. This will provide additional nectar sources and reduce competition. Remember the honey bees don’t mean any harm to you, they are just hungry. Good luck & thank you for caring about the honey bees & hummingbirds in your neighborhood. If honey bees are gathering syrup at abundant hummingbird feeders in the neighborhood, then bringing it home to the hive in our yard, how will this affect the honey. We have a friend you said that if they put sugar syrup into the supers that we cannot sell it as “Pure Honey” and that if someone with a cane sugar allergy eats the “tainted” honey they could have a serious allergic reaction. Is this true? If so, what can we do with the nearly 200 pounds of honey we’ve gathered, and partially bottled. Must we have a disclaimer? “May contain traces of can sugar.” What? I’m a little freaked. Yes, if a beekeeper is feeding their bees while honey collection supers are on (and you never should), the “honey” that the bees make will not be real honey. It will lack the enzymes found in plant nectar and have a different PH. Now as to the question of hummingbird feeders, I truly doubt it would make any difference. I mean if you have 100 hummingbird feeders and no wild nectar – you might have an issue. However, as long as you didnt feed your bees during the harvest, I would not worry. Even if a tiny amount was in there – its no different than bees that will inspect soft drink cans. I see no need for a disclaimer because you dont know there is a problem. Anytime, you sell or give away a food product – you have liability. If they cut their lip on the jar, or have a reaction to pollen in the honey but that very rarely happens with honey. 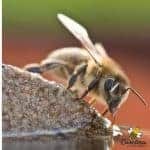 Would hurricane Florence have affected the honey bees in my neighborhood? Lots of beekeepers in my area. Honeybees are swarming my humming bird feeders. Never happened at this level before. Absolutely, if the wind blew all the nectar producing blooms off the trees, weeds or bushes. I read that marbles can burn bees and hummingbirds. The source recommended using pinecones as a non reflective idea. My desire to keep wasps and bees away from my hummingbird feeders is a purely selfish reason, I must carry an Epinephrine pin with me at all times. I try not tonaggravate the bees whenever I can. We depend on our pollinators! I supposed that might be a problem in a very hot region in direct sun..but I’ve never heard of anyone having the problem. Yes, honeybees are pretty harmless as long as you stay away from the hive and dont threaten them. Thank you for this article! Just this week I noticed honey bees on my hummie feeders. Many of our hummies have left, but I still have one who depends on my feeders. Yesterday the bees began to swarm around the feeders, and the hummie could not find a place to feed that did not have bees. I put a pan of very sugary water with sticks in it (for the bees to climb on) on a yellow overturned pot about five yards from the feeders. The bees discovered it today; the pan was covered with literally hundreds of bees all day! Eventually most of the honey bees left the hummie feeders and joined their buddies on the sticks in the pan. My hummie had his feeder again. So here is the problem. This evening I checked the pan and all the sugar-water is gone. Now I am wondering if the bees will start depending on my sugar-water pan for nectar. I want to keep them happy during our next few days of sunshine, but I want to do the right thing for them also. Only a few flowers are still blooming in my garden — coral vine and a few roses — so the poor little bees seem desperate. I live in a very rural, forested area. Should I continue to feed the bees? Is this ethical and good for them? I want to make sure I am doing the right thing or if it would be better not to refill the pan. I will relocate my hummingbird feeders for now. Am I doing the right thing for the bees? Thanks again for this article — timely and interesting! I use honey from local bee keepers every day and support pollinators with many different flowers in my garden. However, after this experience I think I need to plant more flowers that bloom through the fall. I had no idea our bees are so desperate this time of year!